In small bowl, mix Seasoned Sour Cream ingredients. Cover and refrigerate until ready to serve. In large bowl, mix oil and 1 tablespoon taco seasoning mix. Add frozen potatoes; toss to coat. Pour mixture into air fryer basket. Set to 400°F; cook 22 to 26 minutes or until crispy, shaking basket every 5 minutes. Transfer to microwavable serving plate. Top with cheese. Microwave uncovered on High 30 to 90 seconds or until cheese melts. Top with avocado, tomato, green onions and cilantro. Serve with seasoned sour cream. Make it your own! Use different taco toppings, or be lazy and skip the cheese and toppings entirely. 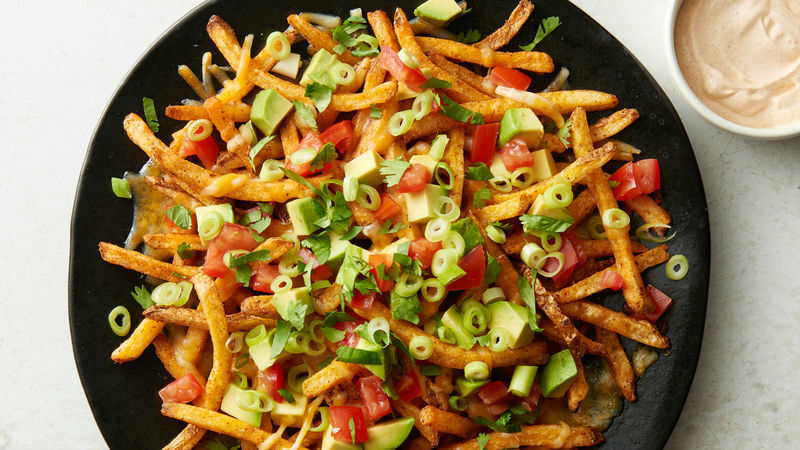 The plain taco fries make a perfect side for tacos, burritos and more. Shaking is essential to crispy fries. When food touches in the air fryer basket, it cannot crisp fully, so it must be shaken or turned often.